Our intention is to bring you Sacred items and tools of healing that connect us even deeper to the Divine. In the spirit of collaboration and reciprocity we foster relationships with many Artisans from our local community as well as different traditions from around the world. Each item has a story behind it. For instance, handmade jewelry made by Natem Uwishin, Traditional Healer from the Shuar Tribe, contributes to the goal of building a school for children of the Ecuadorian Amazon. Delivery & Shipping Method: The large majority of orders are shipped within 3 working days of the order, and delivered in 4 to 7 working days from shipping. However in some cases particularly for stone, metal and wood art items, we may take longer, to ship the order and the same will be reflected in the delivery time against that item.We ship on all weekdays (Monday through Saturday except Wednesday) excluding public holidays.With each and every order, you will receive an email containing the details of the order placed by you. Don’t accept if the packet is open or damaged. If you find if it is damaged after receiving the packet or any other complaints please intimate us within 24 hours. Items offered are subject to availability.Your browser may not support display of this image. The actual colours / finishes of handcrafted products may marginally vary from the online display . Your browser may not support display of this image. Hand-made items are susceptible to slight variations in size. Dimensions are indicative and minor differences are possible. wants to make sure that you are completely satisfied with your purchase. CSS Earth & Spirit Store manufactures, procures and packages items with a certain care and involvement. Even during this process some items can be damaged or may have defects. We appreciate your understanding in looking at CSS Earth & Spirit Store as not just a regular store but an outlet that works to support various outreach projects in the local community and the world. We will take the time to review your concerns on a case by case basis. Below are some general guidelines that we have created to help with your returns. If for any reason you are not completely satisfied with your order, you may return your unused article within seven (7) days from the date of delivery. Please make sure that items are unused, unworn, not damaged and in its original packing. Returns and exchanges can be made once all of the items have been delivered back to CSS Earth & Spirit Store. For your security, please return your item with an insured courier. Please report damaged packages to Center for Sacred Studies Earth & Spirit Store immediately on the date of receipt. You can support it with a photo. We will do our best to help resolve any issues. If you need to send an item back due to a shipping error on our behalf, please re-pack the item in its original packaging and contact Center for Sacred Studies Earth & Spirit Store by email at css.valeriehausman@gmail.com or call us at : (707) 604-7362. In certain circumstances especially if your order has not been mailed out, we will be able to make changes to your order. Please contact Center for Sacred Studies Earth & Spirit Store at (707) 604-7362 between 11AM-5PM (PST) 6 days a week except Wednesday or email css.valeriehausman@gmail.com. Please have your order number and order date ready. If you would like to cancel an order that you have just placed or you need to change details of your delivery address, please contact Center for Sacred Studies Earth & Spirit Store immediately. If your order has already been dispatched or delivered, then you’ll need to follow our Returns procedure. 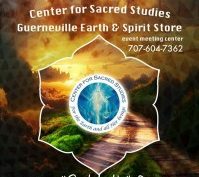 Share the post "About Center for Sacred Studies Earth & Spirit Store"